Zoey does her best to do it all—but this time her fashion plate might be too full! Includes “Sew Zoey” blog posts and fashion illustrations. Zoey Webber would do—and sew—anything for her friends, so she jumps at the chance to make very special outfits for their very special events. Priti asks Zoey to make a modern sari to wear to her cousin’s Indian wedding, and Kate asks for a dress for her State Championships awards dinner. Zoey is sewing up a storm, while also launching an online store with another sewing blogger! Then a string of surprises and setbacks makes a mess of her plans, and Zoey gets really ruffled. 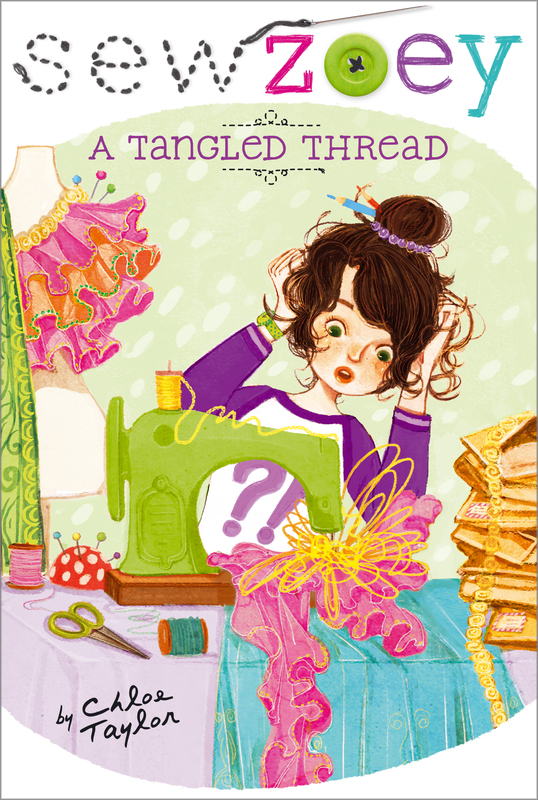 When the sewing gets tough, can Zoey keep going? The great thing about fashion is that there’s always something NEW happening, right? Well, my life’s like that too. I earned enough money from my Doggie Duds campaign to do some serious shopping for brand-new fabric, including the really pricey kind that I usually drool over from afar. I can’t WAIT to get started on some new projects! And speaking of new projects—drumroll, please—I’m also superthrilled to announce my next venture! Actually, it’s a team thing. I’m going to be launching a collaboration Etsy store with another young designer, Allie Lovallo (with our parents monitoring, of course). Some of you might know her from our feature together on TresChic.com, or from her blog, Always Allie Accessories. The store will be called Accessories from A to Z, and—you guessed it!—we’re going to be focusing on accessories! It’s a pop-up shop that will be online for a limited time only, so get ’em while they’re hot! When we came up with the idea, I was going to sew clothes and she was going to make accessories, and we were going to call it Fashion from A to Z. The thing is, sizing clothes is complicated, while accessories are usually one-size-fits-most. So we decided to have an accessories store with some Allie stuff (Allie’s the A) and some Zoey stuff (I’m the Z). It’s going to be A for “awesome.” As you can see from my sketch of some of the things I’m offering, I’ve already been hard at work. But I want to hear from you, readers. Let me know what else you’d like to see in our store! We’re launching the site as soon as we can, so this weekend I’ll be doing all the last-minute work to get it ready. Tonight, though, I have a very important movie date— with two of my best friends! TGIF! Zoey Webber and Libby Flynn eyed each other skeptically, but then Zoey shrugged and went ahead and shook the entire bag of chocolate chips into the bowl. Priti grabbed a wooden spoon to fold them into the batter. It was Friday night, and the three friends were at Libby’s house, baking cookies and watching a movie, but they were barely paying attention to the screen. There was just too much to talk about! And too many chocolate chips to eat. Zoey spread out cookie sheets on the counter, and the three girls began dropping balls of dough onto them. As their hands moved back and forth, Zoey noticed that everyone was wearing their friendship bracelets. They had made the bracelets with a pattern using four different colors of metallic beads to represent each of the four best friends. There was rose gold for Priti, silver for Zoey, copper for Libby, and classic gold for their fourth BFF, Kate Mackey, who was at soccer practice that night. Kate was Zoey’s oldest friend in the world, and Zoey couldn’t help feeling like there was something missing without her there. “Kate would love these,” Libby said. “Tell us what?” Libby asked. She slid the loaded cookie sheets into the oven, set the timer, and turned back toward Priti in one graceful move. “What? When?” Libby and Zoey both shouted. Priti dug around in her bag to pull out her phone. She typed in a search term and held out the phone so Zoey and Libby could see as she scrolled through the pictures of Indian saris. Despite the distracting smell of cookies baking in the oven, Zoey’s mind immediately went into fashion overdrive. Zoey kept shuffling through the pictures, completely entranced by the bright, jewel-tone colors; metallic embellishments; and sumptuousness of the fabrics. Her mind was already buzzing with ideas. How had she never noticed before that saris were the most beautiful dresses on Earth? Zoey was barely listening. Already an idea was forming in her mind of how she’d design a sari, using one of those beautiful, beautiful fabrics, but making the style a bit more contemporary. They all laughed before the ding of the kitchen timer interrupted them. Libby grabbed an oven mitt to take the cookies out to cool. The girls giggled again, and Zoey noticed Libby’s dog, Chester, coming into the kitchen. He was wearing the Doggie Duds clothes she’d made for him, an outfit with a little tie sewn on it, and he looked very spiffy. His nose was twitching fiercely, and he tried to stand up on his back legs to see where the delicious smell was coming from. “He’s wearing his outfit!” Zoey said, pleased. There was nothing more flattering to a designer than seeing someone wearing the clothes she’d made for them. Zoey didn’t have to think for long. Design a modern-day sari for one of her best friends to wear to a gorgeous wedding in India? It was a fashion designer’s dream come true! “Okay!” Zoey agreed. The two girls hugged, and Libby presented them with a plate piled high with cookies. “Time to eat!” she declared. They moved over to the couch where the movie was still playing. They each dug themselves into a comfortable nook on the big sectional and munched on cookies. Priti was right—the cookies were awesome. “Priti, these are the best cookies in the entire world! Have you ever thought about starting a baking blog to go with your mom’s cooking blog? You could call it KarmaKid instead of KarmaMama!” Zoey suggested as she took her third cookie in three minutes. Zoey hesitated a moment. Libby’s aunt was a buyer for one of the biggest and best department stores in the country—H. Cashin’s. In the past, Libby had been reluctant to involve her aunt in Zoey’s fashion-related endeavors, in case it seemed like Zoey was using her for her aunt’s connections. While they had worked it out, Zoey didn’t want there to be any awkwardness. “Aw, thanks, Libby.” Zoey blushed again. She felt like the luckiest girl in the world sometimes, having friends as nice as Priti and Libby and Kate. And now on top of everything, she was going to design a sari that would travel to India!